The top yoga trends 2016. 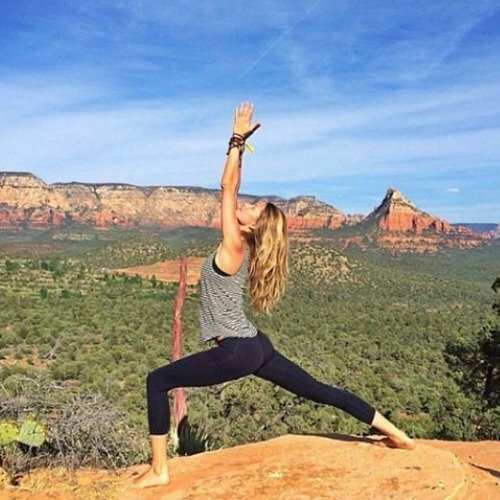 The 5 yoga trends we'll be seeing more of in 2016. There’s no denying yoga has been big business here in Australia in 2015. It seems every woman and her activewear has tried her hand (well, her body) at some kind of yoga this year, whether it be acro, aerial or Bikram. While the movement isn’t set to disappear any time soon, we can expect to see yoga take some interesting new forms over the next 12 months. Here are the five yoga trends we’ll be seeing more of in our gyms and our Instagram feeds in 2016. #Namaste. According to Shyamala Benakovic, CEO of Yoga Australia, local yogis will increasingly marry indigenous storytelling into their practice in the coming months. Although this won’t necessarily filter down into your gym’s yoga classes, there have been some exciting developments in yoga in the indigenous community this year. “In 2015 we saw the first aboriginal man being trained in yoga and how to teach yoga, Wayne Tompkins,” Benakovic explains. No, it&apos;s not a hip way of saying hello to yoga. This trend involves performing Asana or Yoga poses on a 10-12 foot stand-up paddleboard (i.e. a SUP) on a body of water. Yep, it does require some serious balance, so it&apos;s best to do this under the guidance of a trained yoga instructor. "The postures are done on a surface that is continually moving so this practice will test both your balance and core muscles," Benakovic explains. "It requires additional arm and leg strength to hold postures on a surface that is moving, and it also requires quite a bit of focus." As the name suggests, yoga dance incorporates forms, moves and principles from both disciplines. Benakovic says the two are often closely linked — yoga is evident in Indian classic dance, ballet and more contemporary dance styles, to name a few — and we&apos;ll be seeing them together in 2016. "Yoga is used as a practice for dancers and some of the postures can be seen in dance moves, specifically standing yoga postures and inversions," she explains. "The style Barre Yoga is designed specifically for ballet dancers. Most dance schools will have their own yoga teachers to support ballet students and performers." Cancel all your 2016 Date Night restaurant bookings — next year, you might find yourself doing a yoga class with your significant other instead. "Couples yoga is designed to build trust and openness in relationships. It enables couples to communicate in different forms and find ways to enhance or address issues in their relationship," Benakovic says. Evidently the couple that Namaste&apos;s together, stays together. "It&apos;s not dissimilar to partners yoga. Practising on pairs, couples assist and support each other in poses, breathing exercises and meditations." Cancel your restaurant booking and make a yoga date instead. We all know that one person whose love for their dog knows no bounds. Well, next year there&apos;s a good chance these dog lovers will inviting their beloved onto the yoga mat with them as well. Though the concept of &apos;doga&apos; might sound crazy, stretching actually comes naturally to animals. "You will see dogs and cats stretch and perform poses that are similar to yoga as part of their natural way of doing things," Benakovic says. The name &apos;downward dog&apos; had to come from somewhere, right? Who&apos;s up to Downward Dog with their dog? Doga doesn&apos;t require your dog to undergo any training; you simply allow him or her to join in the exercise. Ultimately, Benakovic says, the aim is for owners to bond and "achieve greater harmony" with their pets. "It is important to understand that dogs have no way of telling us when they have had enough and for this reason, it is important to consult and practise with trained professionals both in yoga and dogs," she adds. Have you tried any of these yoga techniques before? What was it like?